Assistant Professor of Economics Geri Mason taught back-to-back courses in different buildings during Spring 2011 and wanted to make sure her second class started productively as she scurried from one location to the other. Her solution, PollEverywhere.com. 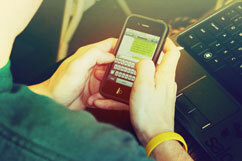 She began each class with an open-ended question projected to the class and a phone number for texting answers. Within the first five minutes of class, she had feedback from all fifty students and students could see other students’ answers scrolling down the screen. Professor Mason could then ask students to get into groups to discuss their answers with others. Within 15 minutes of the class starting, she had students identifying key issues that she would teach about in her lecture. 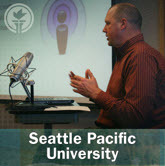 SPU 2007 Teaching and Technology Grant recipients Ryan LaBrie, Don Peter, and Melani Plett demonstrate the use of Adobe Connect in a university classroom. January 31, 2008. 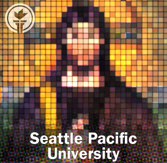 Seattle Pacific University on iTunes U: What Are People Saying?